Quick reviews of three recent niche releases: Eau d'Italie Graine de Joie, Memo Kedu and Van Cleef & Arpels California Reverie. Do comment if you've tried any new or interesting niche fragrances lately! Is anyone here a massive fan of Eau d'Italie? I admit I've mostly lost interest; nothing they've done since Baume du Doge in 2008 has really impressed me, and the shampoo-ish packaging is a turn-off. Graine de Joie, intended to celebrate love, is a sweet 'n tart fruity floral from perfumer Daphné Bugey (notes: pomegranate, red fruits, freesia, pralines, musk and cedar). It's cheerful, mostly clean, and reasonably well done, but there's nothing about it that sets it apart from youth-oriented sweet fruity florals that you can find at your local mall (and that cost a fraction of the price). The Scented Hound said it smelled bathtastic — more like a bath oil than a perfume — and I'll go for that. Not my cup of tea, but if you love sweet fruity florals do give it a shot. 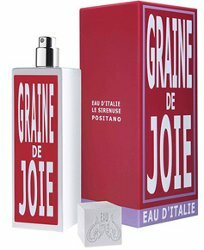 Eau d'Italie Graine de Joie is available in 100 ml Eau de Parfum, $160; for buying information see the listing for Eau d'Italie under Perfume Houses. I couldn't tell you if I was a fan of the French niche line Memo or not — they aren't distributed in the US at all, and I haven't tried most of what is now a fair-sized selection. Kedu was developed by perfumer Aliénor Massenet, and it's the first scent in a new seed-oriented collection called Graines Vagabondes. Kedu in particular is about sesame, and is named for the Kedu plain on Java. They've given the fragrance a summer-y feel with plenty of bright grapefruit and neroli (other notes include mandarin, mate, freesia, rose-peony accord, white musk and moss). It evolves into a quiet, mildly sweet, mildly creamy scent that smells sort of like a cross between roasted nuts and basmati rice. The florals are pale and transparent, and ditto the base. I really like Kedu. It reminds me a bit of Cinq Mondes Rituel de Bengalore, Inde (not that that will help more than 10 other people, I know), partially because they have some vague smell relationship, but also because Kedu (other than its steep price) would fit nicely into the Cinq Mondes' concept of aromatherapy body sprays inspired by 'exotic' locations. I'd love to have a bottle, but to my mind the fragrance isn't fabulous enough to warrant the price. 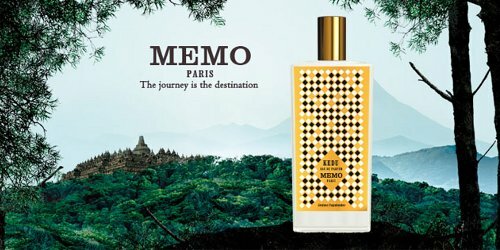 Memo Kedu is available in 75 ml Eau de Parfum, €168; for buying information, see the listing for Memo under Perfume Houses. California Rêverie is the latest addition to Van Cleef & Arpel's limited distribution luxury series, Collection Extraordinaire. It was developed by perfumer Antoine Maisondieu, who clearly did not intend any realistic smell-portrait of the state, south or north. This is the California of the imagination, without the drought and the urban sprawl, making it a good fit with the brand's likewise un-California-ish California Rêverie jewelry. Luckyscent's description mentions "a distant breeze of Hawaiian frangipani", and yes, while there's plenty of orange blossom to stand in for what might be the orange groves of SoCal, we're mostly in tropical white floral territory here, with a focus on the jasmine. It's a middle of the road jasmine: not so clean and light as Acqua di Parma Gelsomino Nobile or Aerin Ikat Jasmine, nowhere near as lush as Nasomatto Nudo or Serge Lutens' A La Nuit. It starts out breezy and it pretty much stays that way; The Candy Perfume Boy calls it "an aerial jasmine". He also likes it better than I do; I wore it quite happily but wanted more oomph or more something — I have enough choices for pretty, middle of the road jasmines already. If you haven't found your perfect jasmine, do try it, especially as Van Cleef & Arpels has now introduced a smaller size for this range. Van Cleef & Arpels California Rêverie is available in 45 ($125) and 75 ($185) ml Eau de Parfum. The Memo one sounds good! I love toasted rice and nut smells. I tried Journey Woman this week — seems like it’s gotten mixed reviews, but on first wear I liked it. Not that it matters since I can’t afford any Amouage. It’s an interesting scent, way more summery than I expected. Wish it cost $75. I am so behind — still have not tried Journey! I am always always behind, just got lucky with some perfume care packages lately (the Journey was from sweet Daisy in NYC). Cheers to being perennially behind! I am more and more interested in smelling California Reverie – I like a nice mixed-white-floral. I’m fine with tuberose soliflores, but not so much with jasmine, which I prefer defanged and hanging out with her sorority sisters (tuberose, gardenia, ylang, tiare, lotv, all the white florals) anyway. It really is a pretty scent, and nicely done & all that. And mostly defanged, although I suppose it depends also on your tolerance. And I wish they’d gone even smaller — 25 or 30 ml? — but it is nice that they’ve added a smaller size. Everyone is loving Rozy, for some reason I feel bad that I didn’t really fall for it. But hopeful about Sotto La Luna. When i was overseas I tried some from the Memo line and most liked Granada and Italian Leather. The bottles are gorgeous too, but unfortunately the price was a deal breaker! And I like that the bottle designs vary. But yes, out of my price range. I tried the California Rêverie and I had the feeling that there was a wild Jasmine that was buried under a pillow. Mine was a decant so I wasn’t sure how strong it truly was. I”d still like to try it again. Can’t hurt to find a tester somewhere & give it another go then! I agree with you, Robin, re: Eau d’Italie’s packaging. It reminds me too much of the overpriced savon de Marseille products from La Compagnie de Provence. And it looks like a late-80s idea of graphic minimalism. Now that I think about it, I think that’s why I’ve steered clear of this brand. I’m not entirely guilty of only reading books by their covers, though. For example, I have explored Patricia de Nicolaï’s work, despite her dowdy packaging (to use Kevin’s apt wording). PdN is dowdy I guess, but they don’t bother me either. At least they’re not garish. But I’d get over EdI’s packaging if the scents were better.